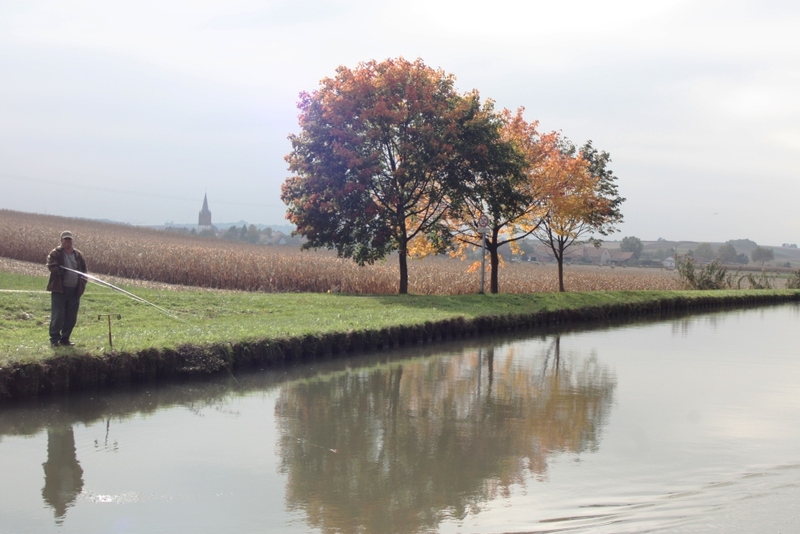 Since our last blog we have been heading back towards Paris for our winter mooring with a few detours along the way. We’re now at Toul, 186 kilometres west of Strasbourg. 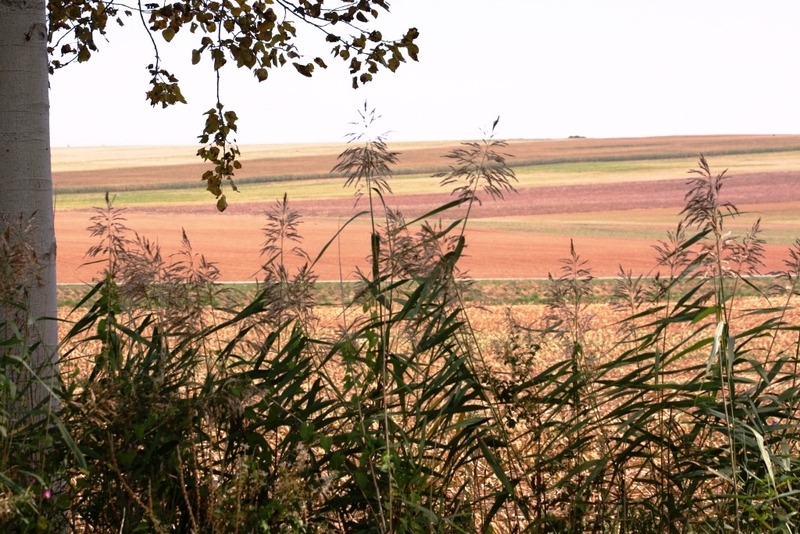 Marne au Rhin map – our latest route. 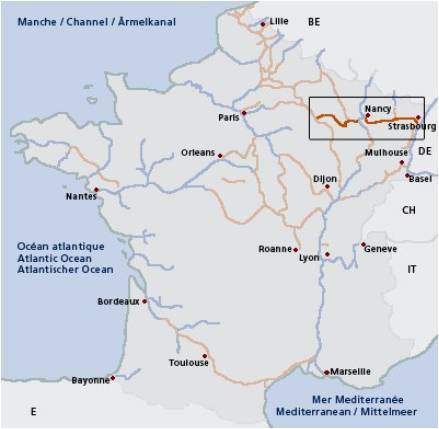 Continuing on the Meuse/canal de l’Est from Charleville-Meziers until just beyond Commercy it become the canal de la Marne au Rhin oust (west) into Toul – 312 kilometres with 57 locks. From Toul we travelled on a section of the Moselle and back onto the Marne au Rhin est (east) into a favourite city of ours, Nancy. 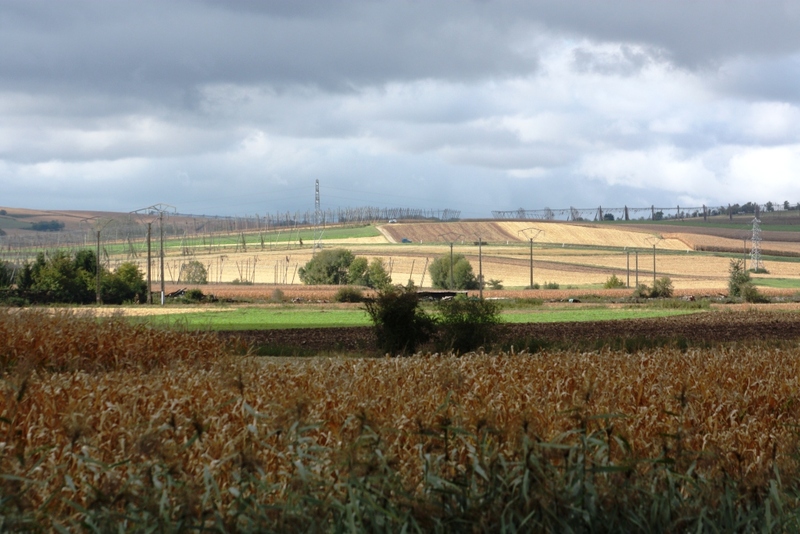 Finally continuing along the Marne au Rhin est from Nancy to Strasbourg and return to Toul. 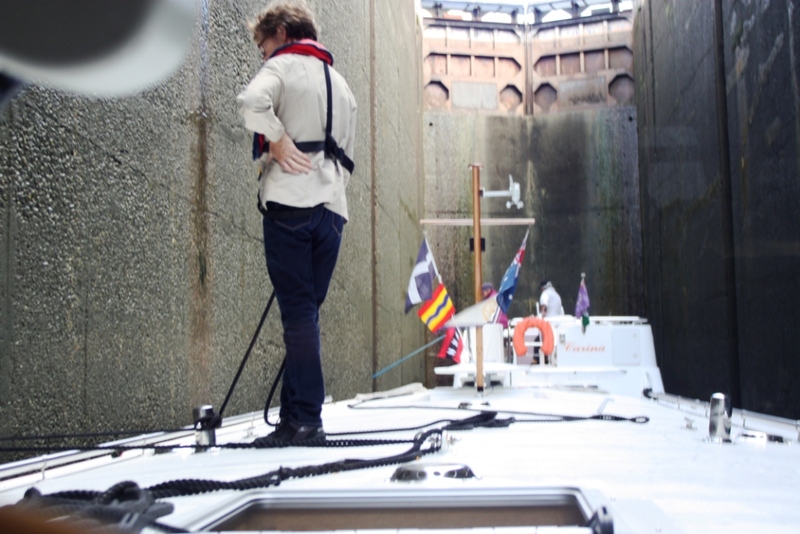 The journey from Toul to Strasbourg is around 185 kilometres with 65 locks, one of which is the deepest in France at more than 15 metres (more information on the Rechicourt Lock here). 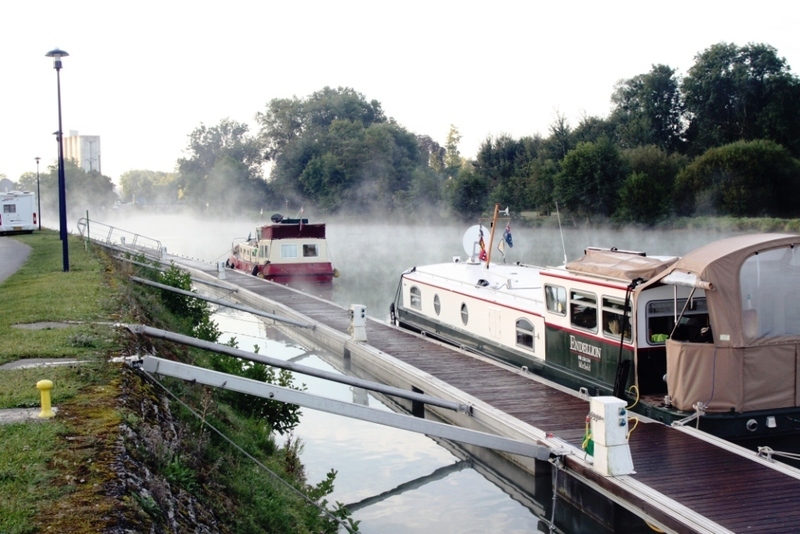 It takes almost 30 minutes to ascend/descend the Rechicourt lock, the deepest in France. There were also two tunnels (one 5.36 kilometres) and the very special St Louis inclined plane: http://en.wikipedia.org/wiki/Saint-Louis-Arzviller_inclined_plane. 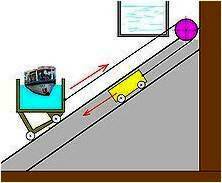 Diagram showing how the inclined plane works, we take our boat into the tank (shown in blue) that slides up and down the hill! View of the inclined plane courtesy of Wikipedia. This inclined plane was similar to the Ronquieres inclined plane in Belgium back in July. There are also twelve or more very narrow (at the towpath level) bridges which meant slowing and passing each one as you would a lock. This trip we did twice, ie, from Toul to Strasbourg and return. It was a very busy and wonderfully interesting trip as you can probably imagine. We intend writing a little more about this interesting journey in a separate piece. Endellion moored at Dun-sur-Meuse one foggy morning. The days are shortening; we’ve had many foggy mornings, beautiful pink and orange sun rises, stormy skies then this past five days glorious sunshine with tops of 24 degrees. Daylight saving (or summer time) ends here in France on 28thOctober (well behind Daylight Saving Time in Australia) and the evenings will shorten as winter sets in. We know all of this and have planned for it but with 350 kilometres and squillions of locks to go to Paris and our winter home, it will be a little bit challenging. Endellion moored alongside Peridot at St Mihiel. 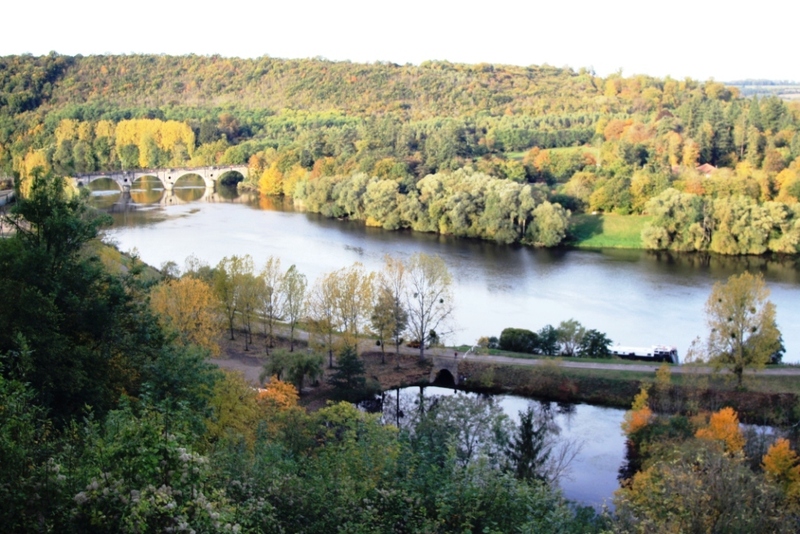 When we wrote our last blog we were asking ourselves why the port at Charleville-Meziers and most of the Ardennes region along the river Meuse was so quiet. We were one of only two or three boats who seemed to be travelling despite good weather and a big sporting event taking place around the port at Charleville over the weekend. Where was everyone we asked ourselves? Then we arrived at the small and lovely town of St Mihiel and found no place to moor, it was full (the pontoons could only take four or so boats). As we approached (it was getting late in the day) to our great delight and surprise we spotted Peridot, the Segar boat of our friends Josh and Kay. Josh waved to us as we approached and invited us to raft to the side of their boat (we are the same length) so we had a safe mooring (what luck).. And Kay put the kettle on. How brilliant was that! Masses of acres of maize still to be harvested. Josh and Kay were making their way to Paris for the winter (for their third time, like us) and it seemed odd to be going in opposite directions considering we were more-or-less doing the same. They had just come from Strasbourg and we were on our way there so with their sage advice, suggestions and very positive experiences to recount we felt even more excited about the days ahead. Alex, Stewart and Margrit outside Strasbourg cathedral. The stunning Moselle river in autumn sun, heading for Strasbourg. That little interlude was a very long time ago, a full month, and since then we have been very busy exploring new waters (the trip to Strasbourg) and meeting up with friends old and new. 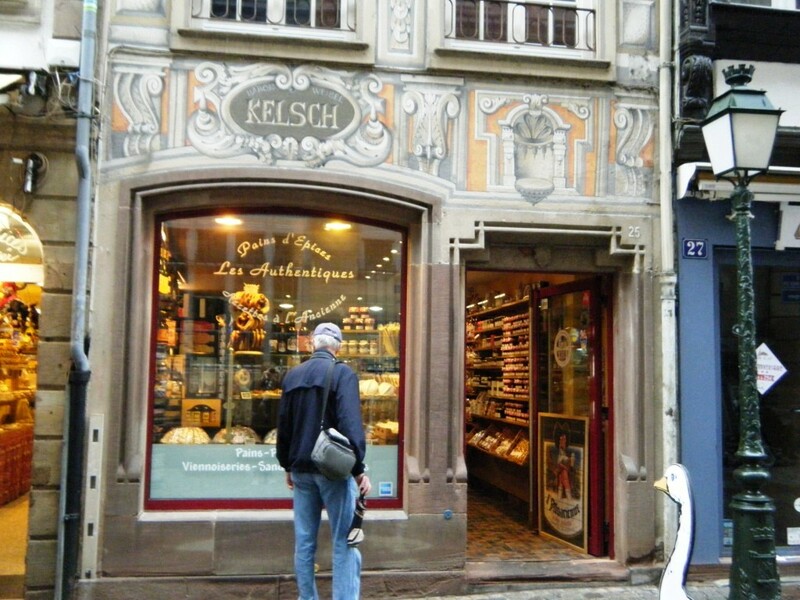 A pretzel and nougat shop in Strasbourg; to us it doesn’t look very French. At one point we had planned on travelling beyond Strasbourg to Basel, in Switzerland, 126 kilometres further on (and only 8 locks). Our aim was to meet with dear friends Margrit and Alex who live at Winterthur not far from Basel. To help reduce our travel time they said they were happy to have an excuse to revisit Strasbourg and to meet us there. It’s a very beautiful city and all the better for having their company and a slow-paced guided tour of the inner city. 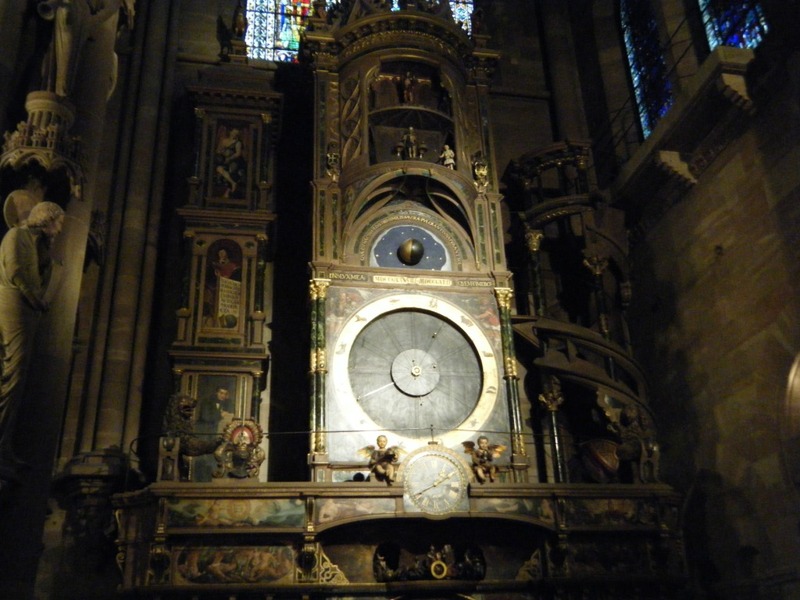 The intricate astronomical clock at Strasbourg cathedral. 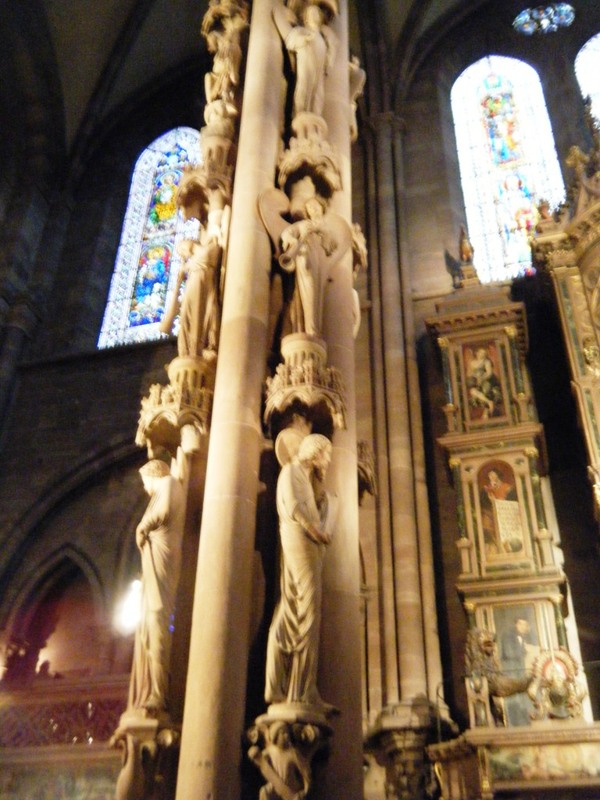 The Angel’s Pillar at Strasbourg cathedral. In particular we loved the cathedral built from the reddish sandstone we saw along the banks of the canal in the region. It is supposed to be the fourth tallest church in the world built entirely in the middle ages. It was a warm and welcoming place despite feeling the deliberate projection of awe from within its ancient walls. We were fascinated by the Angel’s pillar dating from 1230 with many sculptures spiralling up it and Christ sitting atop – this wonderful creation unsurprisingly to us (we’d been to Chartres cathedral from Paris) was influenced (if not worked on) by the Chartres cathedral creative masters. Also, behind the pillar, an enormous and complicated astronomical clock which appropriately was Swiss made (by Conrad Dasypodius ). 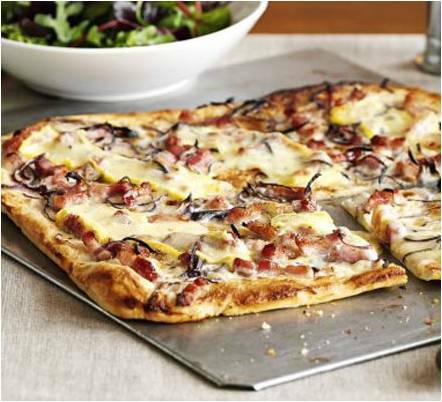 The pizza-like tarte flambee which is traditionally very thin pastry covered with crème fraîche, thinly sliced onions and bacon. Alex, who had only just retired from his professional life as a chef, introduced us to the Alsatian ‘tarte flambée’ which he called ‘flammekueche’, the German/Alsatian description. Alex said, don’t say the word aloud.. but it is like a ‘pizza’. He didn’t want anyone to be offended that we’d use an Italian word and not given due respect to the origin of this Alsatian creation. In this region of France (very close to the border with Germany and for many years a German ‘possession’) most menus are in French and German, everyone seemed to speak French or German and not usually English. Even my distant memory of German bubbled up as I could understand the basics of conversation in German. 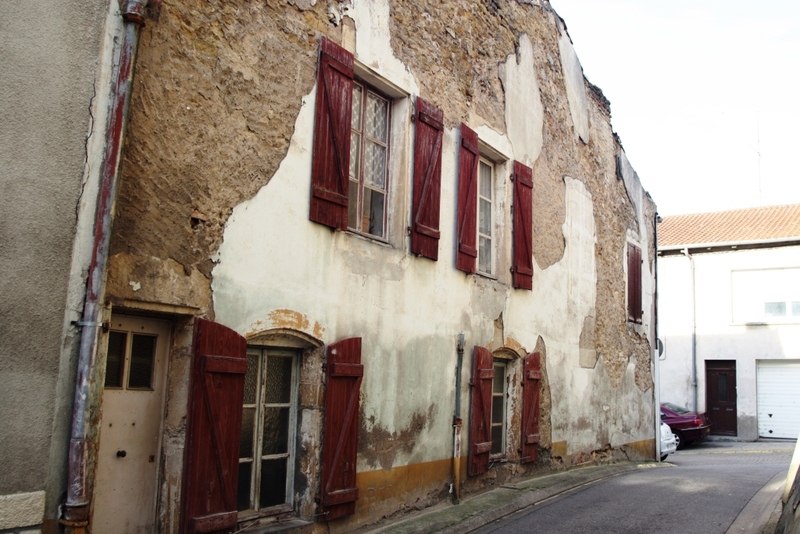 This part of France made us feel we were travelling in a new country more akin to alpine towns. A beautiful sunny afternoon along the Marne au Rhin, beetling back to Nancy. The wonderful thing about life on board Endellion is we can and sometimes must change our plans as we go .. and sure enough, having decided not to visit Basel this time around (it’s on the radar for 2013) we cut our visit short in Strasbourg and beetled back to Nancy to be in time to meet other dear friends, Ian and Pam McMillan, arriving from Australia. We had suggested to them we could meet in Strasbourg (as that was on their itinerary) but with the hindsight available (having travelled from Nancy to Strasbourg) we thought Nancy was a better meeting place. The reasons: 1. It’s a beautiful city like Strasbourg; 2. 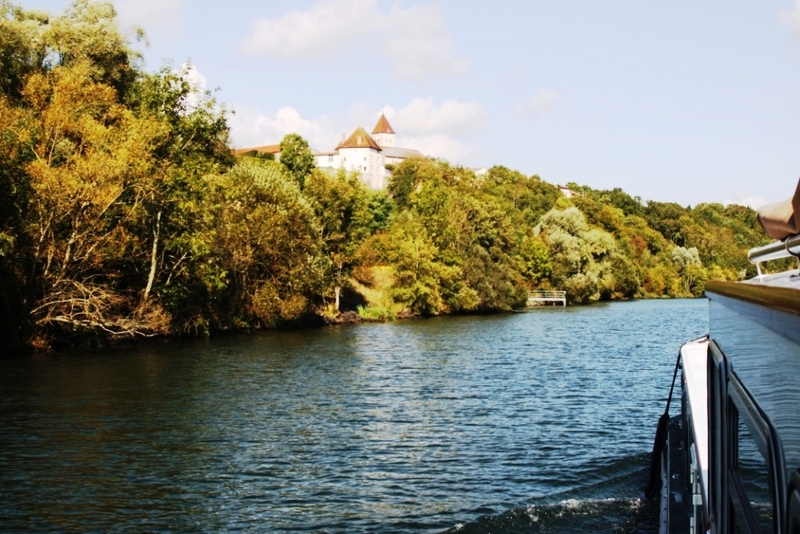 The waterway journey from Nancy to Toul is fabulous; 3. There are only a few locks from Nancy to Toul – much as they can be interesting 60 or so of identical dimensions can be rather monotonous. 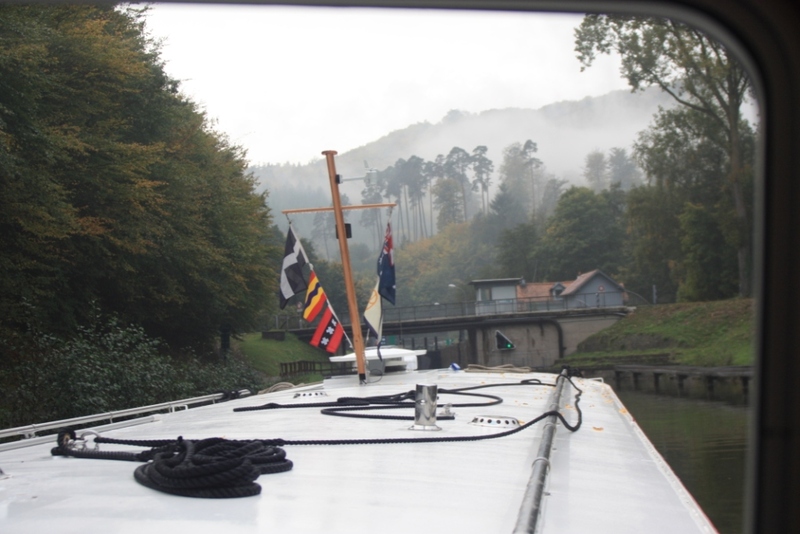 So to Nancy..
A misty and beautiful morning along the Marne au Rhin canal leaving Strasbourg. Our experience in Sydney and other major cities is that their biggest tourist attractions are a magnet for overpriced cafes/restaurants with below quality food and beverage. So we certainly weren’t going to eat or drink at the famous Place Stanislas in the heart of Nancy. 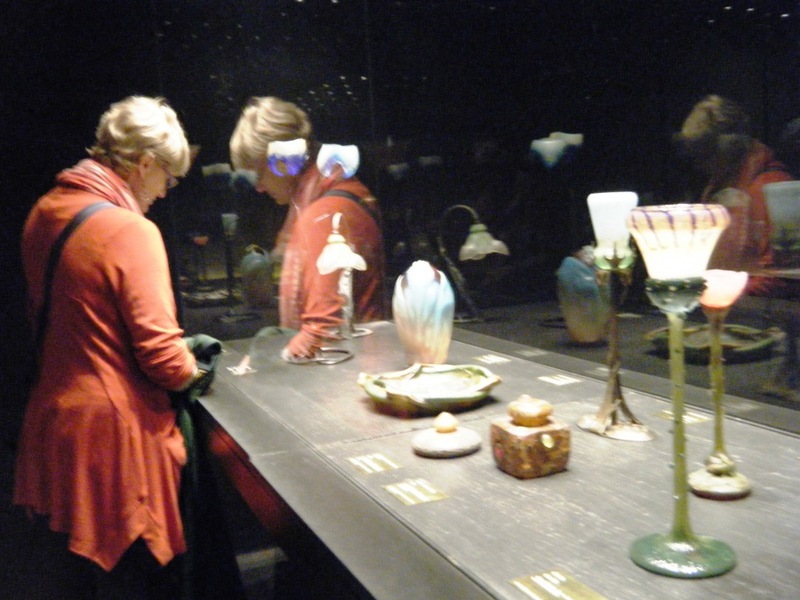 Pam studying the Daum glass and lamps at Musee Beaux Arts, Nancy. 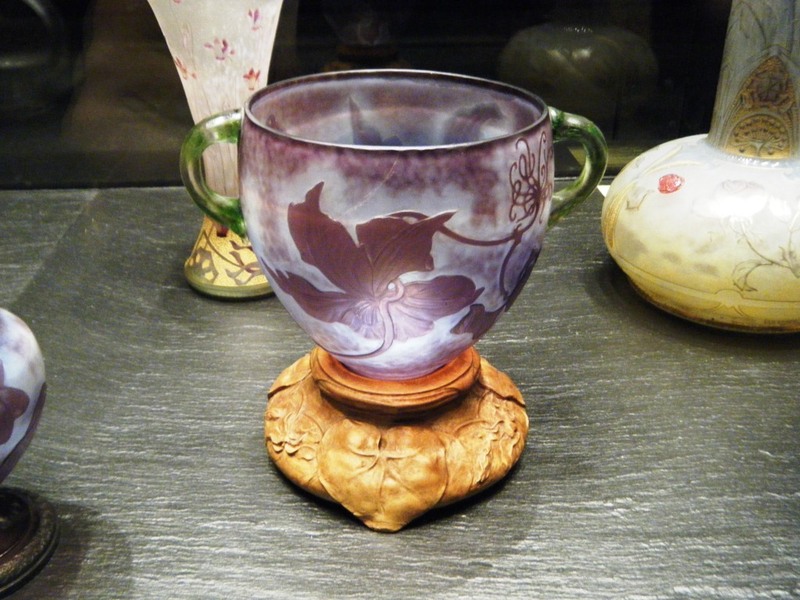 A stunning Daum art nouveau vase at the Musee Beaux Arts, Nancy. 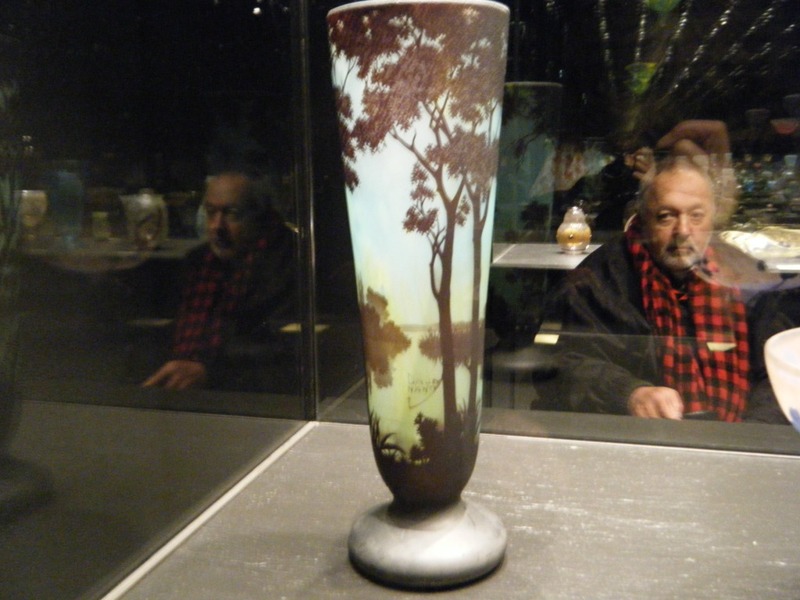 Stewart also studying the beautiful Daum glass. After a wonderful day visiting in particular the Museum Beaux Arts, located at Place Stanislas, we headed for rue de la Primatiale. From last year’s experience we knew of a wine bar, L’Echanson, with character and huge patronage in this lively street. We discovered this wonderful little place the previous year with other dear friends from Melbourne, Di and Michael. We arrived in the evening to find it packed (as expected) and being a tiny room we were nervous about how we’d get inside. There were no available tables and fitting a wheelchair in amongst the many bodies and squashed-in chairs was daunting. As we stood outside peering through the glass assessing whether we should push our way through, a customer sitting beside the door swept us up (so to speak) suggesting he opens the second door to make it easier to enter with the wheelchair. On the wheelchair we had carried our short ramp for the one step we often encounter, this makes turning a little tricky as it can often swipe innocent people standing or sitting around the wheelchair as Stewart turns! We simply had to go inside with his help and the only space available was right at the bar: A tiny space where three or four workers flashed around serving drinks inside and out on the pavement in between watching food sizzle under the head-high grill. In Australia and Britain this working space would not have passed OH&S legislation and would therefore not have operated. They have the same legislation here in France but generally speaking we notice the rules aren’t noted and/or regulated! They are working safely if not in comfort. We sampled their excellent Chablis and a not so good Beaujolais .. and just as we were planning to leave our host suggested we take a nip of the in-season Mirabelle liqueur (which we later called fire water for good reason) to make the bill more palatable perhaps! Squashed in as we were, our neighbours (all French) had started to try out their English .. the lady to our left told Pam and I, “be careful with that Mirabelle it looks innocent but it is very strong”. She was right! We left the warm and very merry wine bar with pink cheeks and lots of laughter to cross the little car-free street into the completely contrasting slick and modern restaurant, Les Petits Gobelins. 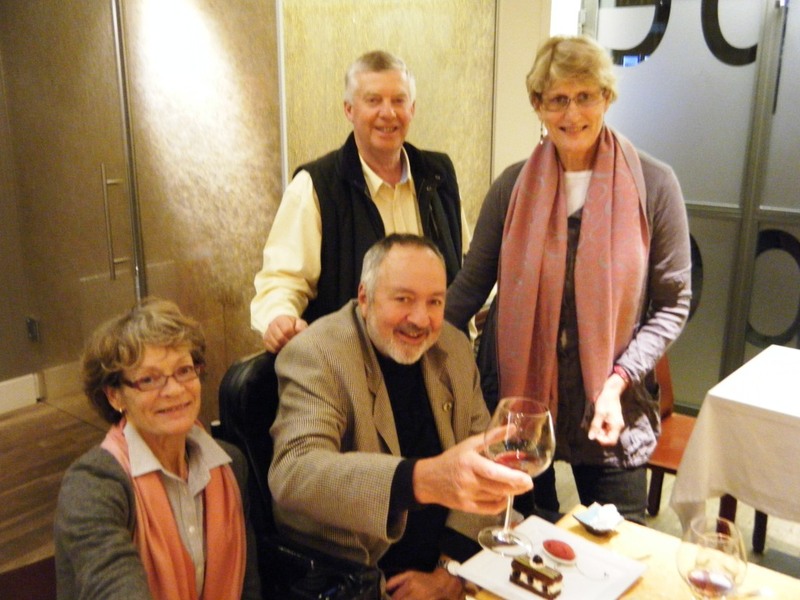 Lesley, Stewart, Ian and Pam at les Petits Gobelins in Nancy, a highly recommended restaurant. We’d worried this small restaurant would be a little bit too professional for our liking and comfort; all glass, white tablecloths, slick service .. everyone totally on their toes. All of this was true but there was so much more. A first ever wonderful experience: when we crossed the road we could see an aluminium ramp up to the one step into the restaurant, ie, they had put down a ramp especially for us. This has never happened before. We’d carried the ramp and didn’t need it. We were made to feel totally welcome. The one male/female toilet was very large and we discovered wheelchair accessible AND on the ground floor, another first. In France the majority of restaurants have their toilets on the first floor! 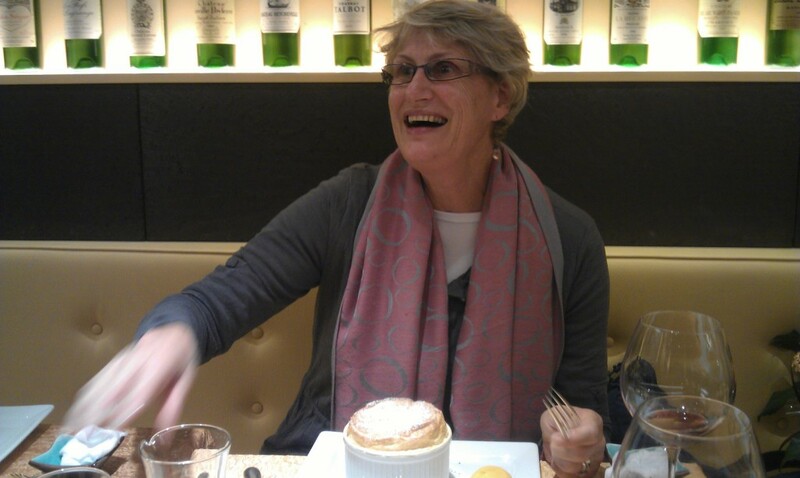 Pam’s face says it all for us .. wonderful food at les Petits Gobelins in Nancy. What a fabulous night we had .. with the pluses mentioned already we also all agreed that their menu and quality of food was the best we’d experienced in a very, very long time. Well done to the Petits Gobelins (we will write more in our next favourite restaurant section). There was so much more to Nancy including another very good restaurant, the Excelsior, which was huge, seating around 200 but always full it seemed. It is an original brasserie from the 1911 art nouveau period: creamy moulded ceilings, stained-glass lead-light windows, chandeliers with glass from the famous Daum glass makers we’d seen in the museum Beaux Arts earlier. There are many art nouveau and the slightly later art deco buildings to admire and ask, is that nouveau (late 19thcentury up to WWI) or deco (from the 1920s through the 30s)? The covered markets are fantastic, huge and with a wonderful range of local produce. Looking down on the Moselle from Liverdun town, Endellion just visible. 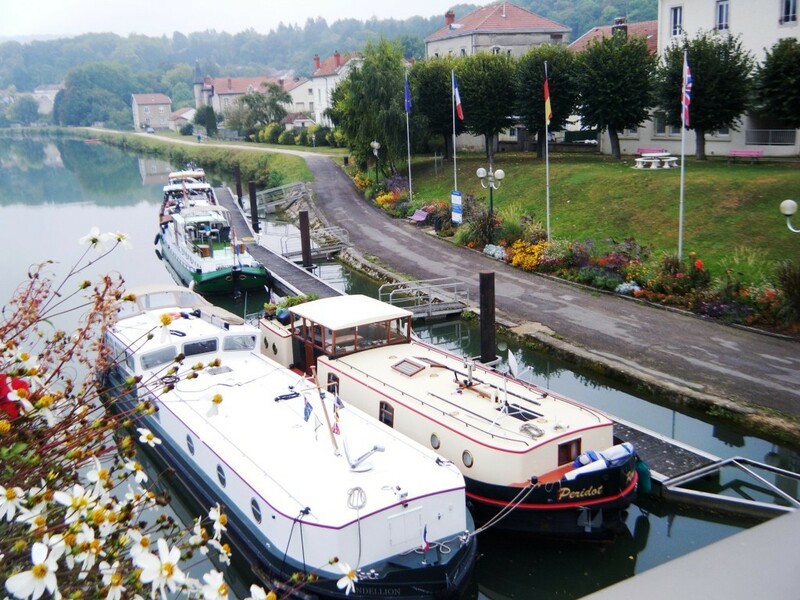 From Nancy we travelled the short journey of around 37 kilometres to Toul, with Ian and Pam on board, via Liverdun. During archaeological excavations in this town they discovered traces of the Bronze Age (circa 1000 BCE), Gallo-Roman Frankish graves of the 7th and 8th centuries (jewellery, weapons, etc.) which are now in Lorrain museum in Nancy (unfortunately a place not accessible to us). In need of some repair, the wonderful old buildings of Liverdun. Of interest to Ian and Pam though, on the late afternoon when they explored the town set way up the hill above our mooring, was the near-war going on between white vans roaring around the steep and narrow streets fighting over piles of rubbish. It appeared this was the eve of a special rubbish collection and these warring vans were after anything metal, leaving the rest of the real rubbish for the following day, and perhaps the official council rubbish collectors. Then back to Toul, another ancient town with a largely intact star-shaped fortification like those we saw in the Netherlands, and Lille in northern France. The view from our mooring outside the city walls, looking over the fortification at Toul cathedral St Etienne (left) and St Gengoult’s church to the right. 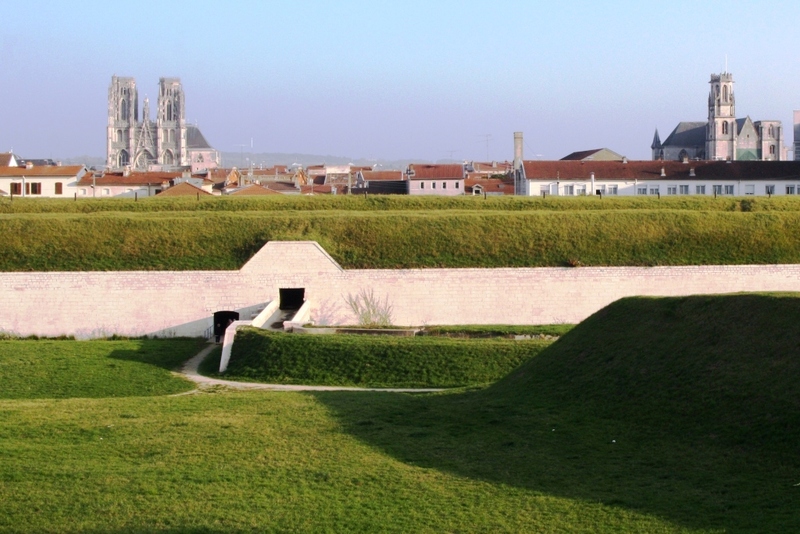 What we see here today in Toul was work by Vauban who’d created most of the fortifications we’d come across around France and into Belgium. It wasn’t until now we realised that the concept and design was not Vauban’s but Italian, being employed way back by Michelangelo for the defence of Florence. It is still very interesting to see how much of the star formation remains here in Toul and to be sitting just outside the walls, in our port, is at times daunting. 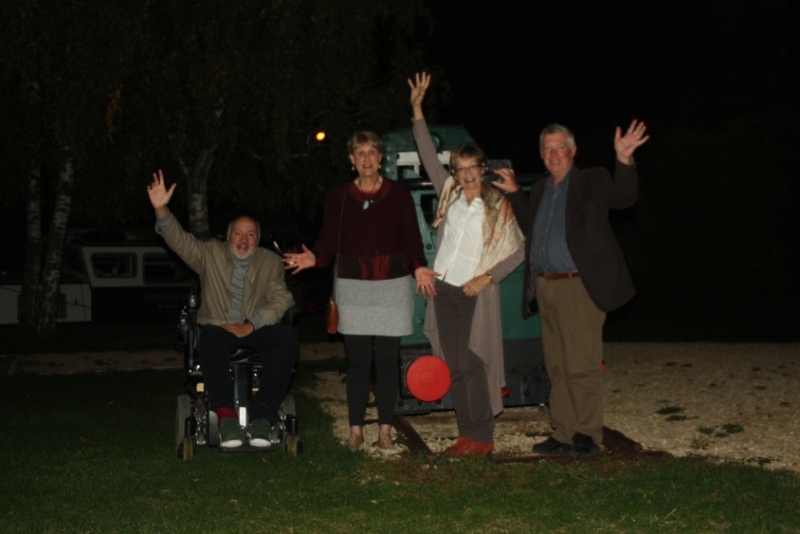 The highlight of Toul, this time around, was birthday night for Stewart! We’d booked the only really good restaurant in town called ‘La Table de Victor’ run by a slightly idiosyncratic Maitre D who is usually so busy she has no time to be a little bit polite. She can’t or won’t speak any English to occasionally help us out, but we love the place and enjoy her character. She is professional and concerned more with serving the food and wine than engaging with us .. That’s hardly a problem. Our Maitre D was in fact the most relaxed and helpful we’d seen her, we had a great night ending with their wonderful soufflé de Mirabelle, a local plum. This, we realised, was the same fruit we had in our ‘fire water’ back in the Nancy wine bar. Stewart, Pam, Lesley and Ian off to celebrate Stewart’s birthday. That’s a miniature train behind us at the Port de France, Toul. 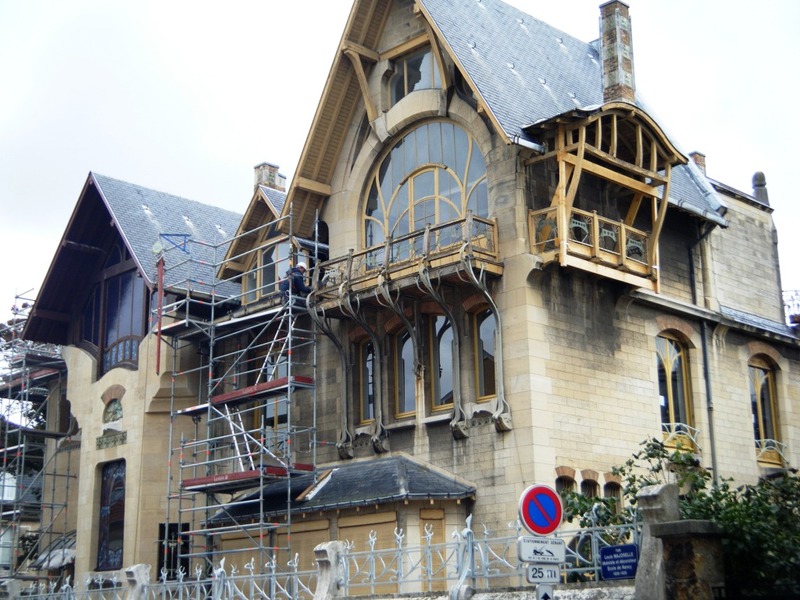 Now in Toul which we love we are waiting for Duncan, our mechanic from Lorraine Marine, to return from holiday next Monday and hopefully this will coincide with the arrival of all of the missing parts to install the new Kabola diesel fired heating system. We will sign off and report again without such a long gap between blogs as the last one .. we have some funny events to report to you. This time, none that involved boats and heart-in-mouth moments or frights! Our love and best wishes to family and friends. 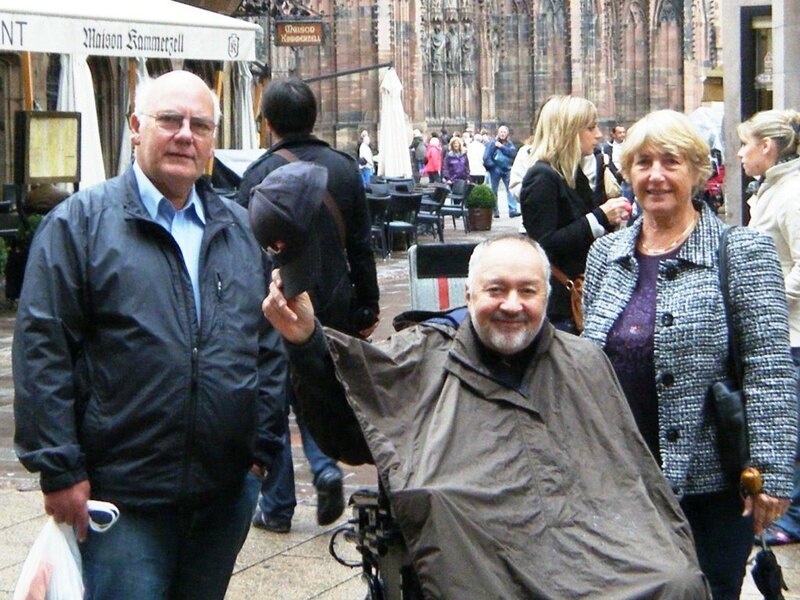 This entry was posted in Accessibility, Waterway life, Waterway services and tagged Boat services, Endellion barge, Nancy, Paris, Strasbourg, Toul, Travel, Wheelchair access. Bookmark the permalink. Hi Marg.. so lovely to have your message and hope you are both in great form. We’re heading back in to Paris and for Christmas we are hiring a van and driving to Cornwall to stay with my family for a week. In March we leave Paris and head south perhaps as far as Lyon and then up to German (we think!). 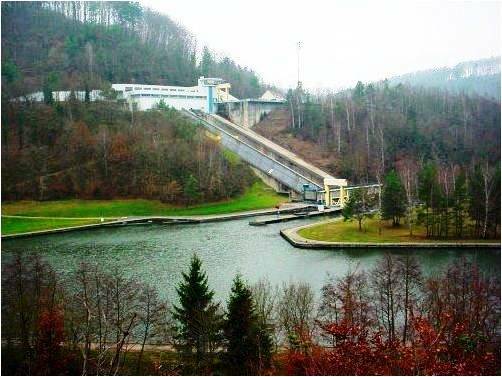 Love your comments on the inclined plane, they are so efficient for we boaters although there must be significant queues in summer.Take care ..love to you and John.